The greater the distance your food travels to get to your table, the more oil-dependent your lifestyle. Saving energy is one reason why we’ve expanded our fruit and vegetable production. Freshness and knowing that it was safely grown are other reasons. But gardens themselves take resources, particularly water. Although we’ve had somewhat decent rainfall this year in Minnesota, fresh water is a valuable resource that really needs to be conserved. We have only one rain barrel and we haven’t always used it well. We want a multi-barrel system with a pump but we’re not there yet. Even the multi-headed sprinkler system I set up hasn’t been working properly. Next year I’m going try the newest low-tech watering trick every garden website is showing – plastic pop bottles planted upside down near voracious plants like tomatoes. We eat something from the garden almost every day, but I’m also learning to process vegetables for winter. I’m most familiar with water-bath canning. I can tomatoes, sauce and pickles – things with high amounts of acid. It takes quite a lot of water to wash the vegetables and to fill the canning pot. And it takes a fair amount of natural gas to heat all that water. If I’m going to be canning two days in a row, I save the water in the canning pot, but I have a very small and inefficient kitchen. I can’t keep a huge pot of water sitting around. If it’s not going to be used soon, we “water” the compost bin (compost breaks down faster when it’s got the right amount of moisture) or the veggies with it. Canning together saves resources and is a lot more fun. In the past month, I’ve been canning with my neighborhood Transition group (Transition Longfellow). 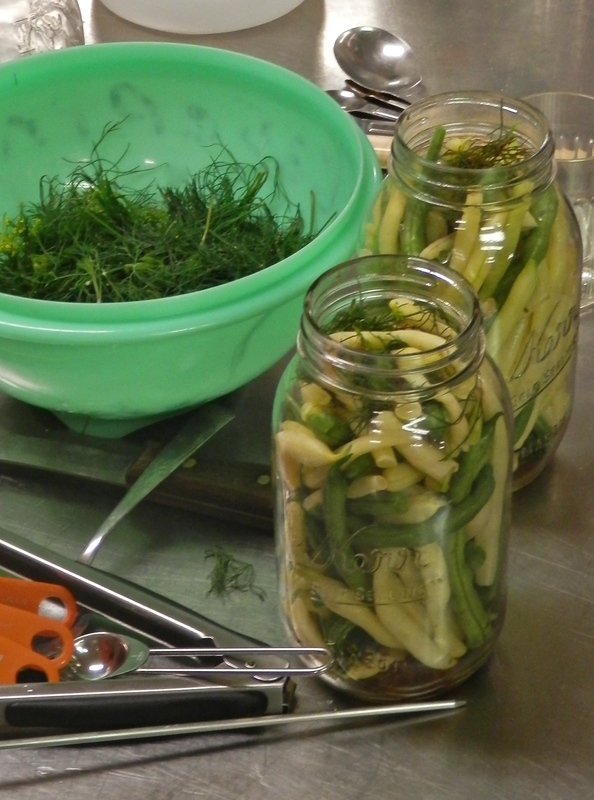 As part of our reskilling efforts, we’ve been teaching folks how to pickle veggies and can tomatoes. By doing these projects together in small groups — many people using the same water bath — we save water and natural gas. I recently bought a pressure canner so I can process low-acid foods like beets and green beans and meat. At first I couldn’t understand why people said it was more efficient because a pressure canner takes far more time to process foods. Now that I’ve done my first batches of soup and broth, I understand. The pressure canner uses only a couple of quarts of water – as opposed to many gallons used in the water canner – and once it reaches boiling, I can turn the gas to the very lowest setting. Pressure keeps the heat high. I’ve got two more food preservation methods to learn: dehydrating and fermenting. I’ve just bought a pickling jar to ferment cucumber pickles and a glazed crock to ferment cabbage for sauerkraut, both from EggPlant Urban Farm Supply. They also have a glazed water-seal pot for pickling, which is locally made. I’m in love with it but it’s too expensive for me. Preserving Food without Freezing or Canning: Traditional Techniques Using Salt, Oil, Sugar, Alcohol, Vinegar, Drying, Cold Storage, and Lactic Ferment,” by The Gardeners and Farmers of Centre Terre Vivante. 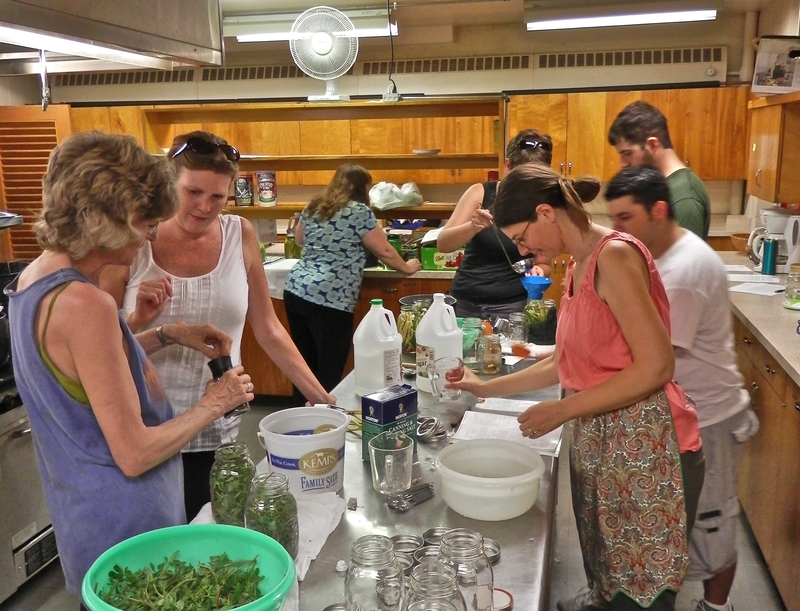 Independence Days: A Guide to Sustainable Food Storage & Preservation,” by Sharon Astyk. This entry was posted in Food/gardening, Groups/Events, Reskilling, Water. Bookmark the permalink.